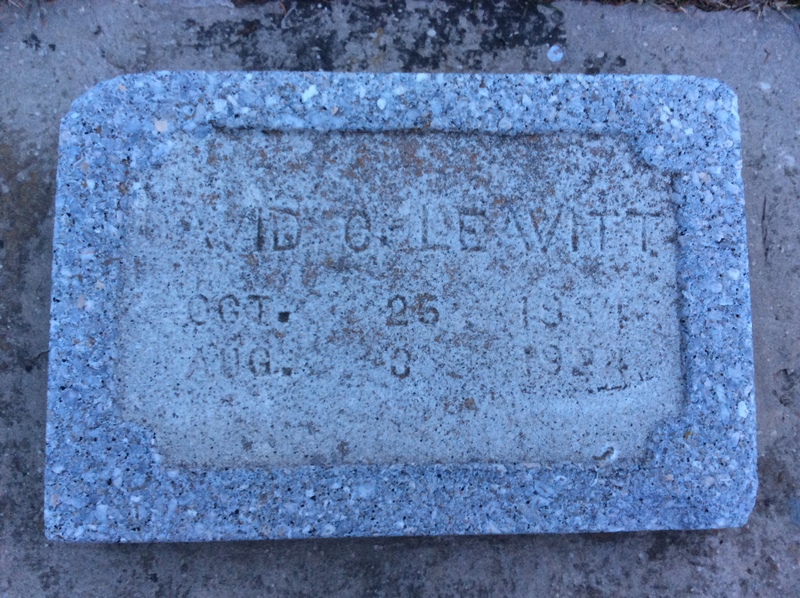 For a Sympathy Saturday Post, I choose to nominate my 2nd Great Grandparents, David Cate Leavitt and Ella Gertrude Bird Leavitt along with their son, Claud Leon Leavitt. Oh heavens, I sure hope I am not the only one who feels the writer’s pain while reading about the death experiences of their loved ones. The narrative that we have for Ella was written by her baby girl, Ella Maud Leavitt Brown in 1979. Maud’s narrative about her mother is filled with heartfelt memories and serves as the life tribute from a girl who dearly loved her parents and her favorite brother. David was ill with what they called “Black Lung,” but was still working in the mines. He would come to Salt Lake City on weekends and whenever he could. He came home one time and was very sick with pneumonia and a bad heart, and on 4 August 1924 he died. Ella had his funeral in Provo, Utah. 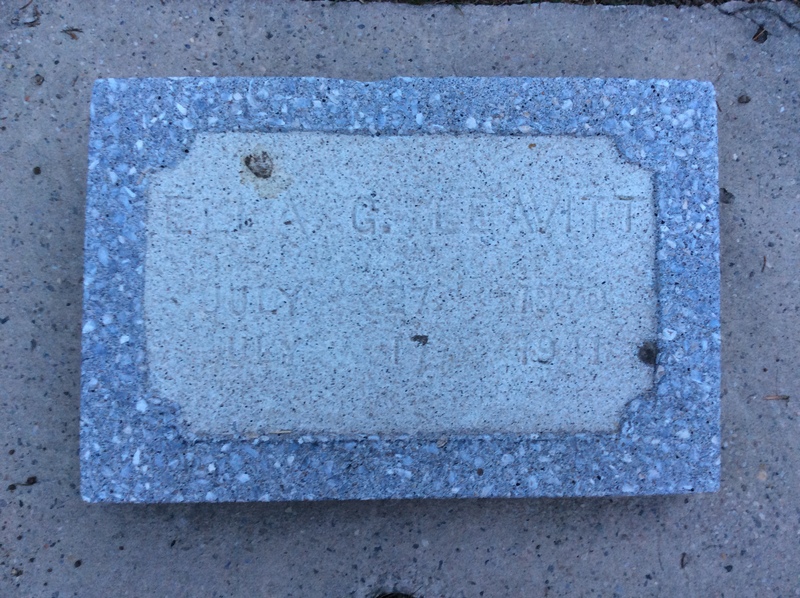 That was where all his brothers lived, and he was buried in Provo City Cemetery in August 1924. The Bishop of the Ward they lived in in Salt Lake City, traveled to Provo to speak at his funeral. David had been a good man, and a good father, and grandfather. Ella would miss him terribly, but she continued on with her lot in life. He had been working in the eastern United States and had been laid off. It was then the start of the “Great Depression” Claud was working his way back to Utah and was in Omaha, Nebraska. He was working for the railroad and had train tickets in his hand when he was either knocked down, or pushed, or fell (we don’t really know) off the platform and under the moving train! The same way he had got his legs cut off years before!!! The news of this was almost more than Ella could bear, but somehow even though you don’t think you can, you have to go on—and Ella did, with her faith in God! The summer of 1941 Ella’s cousin (Roxie Wood Terry) came and spent a few days with her. When it was time for her to leave she talked Ella into going back home with her to St. George, Utah for a visit, Ella did. They had a wonderful time that summer (this was only the second time that Ella had been back to the place of her birth in the 69 years of her life). They visited old friends, and old places they had known as children. One hot day they took a lunch and walked out to “sugar load” (a flat top mountain where they used to play). The sun was very hot and they had walked a long way, and they were very tired when they arrived back home. Ella got sick, and through exhaustion she suffered a very bad Stroke. Her cousin called the children in Salt Lake City and they, Maud and Roxie, got on the next bus leaving for St. George. When they arrived there Ella could not talk, and could not move one side of her body. It had been a really bad attack! The girls knew she wasn’t going to live. They sat by her side all during the day and night. The next morning around 10:00 o’clock on 17 July 1941 Ella was taken home to live in eternity with her dear husband, their two daughters, and their son. R.I.P. my departed grandparents and uncle and may Maud’s treasured memories of you live on. As many know, I have placed intense focus on one branch of the family for the past five years I have been doing genealogy: the Deans. I was thinking back today on the item that gave me the hammer to begin breaking through brick walls for this seemingly impenetrable line and shocked myself with the realization: it was an 80 year old chain letter! That’s right, a culturally superstitious piece of junk mail kept by my great-grandfather was the key to unlocking one branch of the family. How, may you ask, is a useless piece of paper valuable to genealogy research? For the love of all that is holy can you at least write legibly?! The Little Cottonwood Creek; the old timers tell me, got its name for cottonwood trees that lined the banks of the stream which started at the head of Little Cottonwood Canyon and flowed to its destination, the Jordan River. Little Cottonwood Canyon Stream was one of the first  streams in the Salt Lake Valley that Pioneers made filings for irrigation rights. When one or more farmers wanted to take out water from the Little Cottonwood Creek at a certain point on the creek they would write their intentions on a piece of paper or cardboard and date it and tack it to a post driven into the ground at the place where they intended to take the water from the stream. Starting in 1848 their filings were made Priority Rights and were established through diligent use up to 1856. In later years these ditches were enlarged. Beginning in 1867 other ditches were dug to take surplus water out of Little Cottonwood Creek to irrigate more land. In high water time there is still water that flows into the Jordan River. June 16, 1910: Water Rights in the Little Cottonwood Creek were apportioned by Judge Charles W. Morse of the District Court. Judge Morse found that prior to 1856 all the water of the stream; when it did not exceed 94.79 cubic feet per second—had been appropriated and that the following ditches constructed before that date are entitled to the amount of water referred to as Primary Water. Surplus Water is water in Little Cottonwood Creek in excess of 94.72 second feet. The court appointed a Water Commissioner to carry into effect the decree; Peter Van Valkenburg, Sr., was appointed to this job. On the death of Peter Van Valkenburg, Sr. Peter Van Valkenburg, Jr. filled his place; and when Peter Van Valkenburg, Jr. died, Orin Van Valkenburg filled the job and is at present water Commissioner. His job is to measure and regulate all water taken out of Little Cottonwood Creek. and Robert Burrows Pate who took water out of Little Cottonwood Creek to run his Pioneer Flour Mill located on 1300 East and 7400 South—Creek Road—built soon after his arrival in 1852 in Union, Utah. I, Ira Proctor, as a small boy have played along the banks of the Little Cottonwood Creek and crossed it on a foot-bridge many times on my way to the one-room school house on Creek Road. The foot-bridge was located just a short distance above Tom Erickson’s home. In later years I have helped fight the Creek in high water time to keep it within its channel. I have irrigated my farm with water from the Little Cottonwood Creek through the Nickle Ditch and the Last Chance Ditch. It seems that part of my life has been connected with the Little Cottonwood Creek, in my later years cleaning and maintaining the creek bed. I remember as a boy we used to have more snowfall in Big and Little Cottonwood Canyons and we were able to use sleighs part of the winter. At times the roads into the canyons were closed on account of snowslides. We didn’t have the roads cleared those days; we traveled over the snow. Due to the heavy snowfall in the mountains wild cats used to follow the Creek down into the wooded area below Hyland Drive (now called Forest Bend). There were plenty of birds, pheasants, and rabbits—and the neighbors’ chickens—for the wild cats to feed upon. My father, Alma Proctor, and his dog…[killed] three or four wild cats every winter. The dogs would pick up the trails of the cats. When they got close to a cat he would climb up a tree and this made a good target for the men to shoot him. When spring came and in June the property owners along the Creek were always worried about the spring floods. I have gone with my father, Alma Proctor, many years and our neighbors Frank Greenwood, Victor Erickson, Henry Erickson and others helped sand bag the banks; we also cut trees and anchored them to the banks to jeep the Creek from over-flowing and cutting another channel. Salt Lake City took very little water out of Little Cottonwood Creek during the years, so we had the full flow of the Creek. He first bridges built over the Little Cottonwood Creek were on (20th East) Hyland Drive and Pepper Hill. They were built by my grandfather David Proctor, a Pioneer, who was a Road Supervisor in Union and other parts of the County for sixteen years. The material in these bridges all came out of Big Cottonwood Canyon. The trees were cut into logs and hauled to where the bridges were built. Hauling was done by team of horses and wagon. The side walls of the bridge were of logs cribbed and cut by ax to fit and were tied; the walls and the  stringers were logs placed upon the side walls. The plank for the deck of the bridge was made of trees cut and hauled to the saw mill at Mill G. Flat, Big Cottonwood Canyon, and cut three inches thick and any length ordered. The saw mill was owned and run by a Pioneer Nelson W. Wipple. Now the ax and the men who knew how to use one played the most important role in the building of these bridges. The Little Cottonwood Water Company made a test of the flow of water around the Creek by Peppers Hill and found they were losing water from seepage in the gravel creek bed. On January 3, 1911 an application was filed by Peter Van Valkenburg, Sr. on 5 Sec.ft.of water. It was proposed to save this amount of water by diverting the flow of Little Cottonwood Creek through a Cut-Off Ditch which would eliminate seepage from the old channel of the Creek. The application was approved Oct. 20, 1911 and the State Engineer issued Certificate No. 858 for 5 Sec.ft.of water. The Little Cottonwood Water Company, at its regular meeting July 6, 1918, passed a motion that the water saved from seepage by the Cut-Off Ditch be apportioned to the various ditches. 3.03 Sec.ft.of water was saved by the Cut-Off Ditch. The Cut-Off Ditch was built in about 1912 or 1913. The right of way for the ditch was purchased from David Nickles and Sam and Jud Russell. The ditch was to be lined with rock. The contractor who took the job was David Brinton of Holladay, Utah. The excavating of the ditch was done by plow and scraper drawn by a team of horses. Many of the rocks used to line the ditch came from excavating of the ditch and ground nearby. John H. Walker, Sr. of Union, supervised the work for Little Cottonwood Water Company. In June, 1919 a warm south wind was blowing and the Little Cottonwood Creek went on a rampage. Water spread all over the ground by Peppers Hill and down through the low lands now called Siesta Drive. Victor Erickson (who, as mentioned, lived close to the creek) woke up in the middle of the night and looked out and there was water all around his house. He dressed and went for help; they spent the rest of the night lighting the bank of the Creek with sand bags and with trees which they cut and anchored to the banks. They used kerosene lanterns to light their way. Farther on down the Creek the high water washed out the bridge on Hyland Drive (20th East). The only way we could cross the Creek was to go down to 1300 East by Milne’s Service Station. Later on when the flow of the Creek went down to its normal size the Salt Lake County Road Supervisor started to build a new bridge. The second bridge was built with cement walls, deck and side rails. The cement was mixed on a mixing board (small platform) by four men—two on each side of the mixing board using square mouth shovels to stir the cement; and then the cement was put into whell-barrows and wheeled to the bridge forms. While the bridge was being built, people hard to ford the Creek on the west side of the bridge. How fortunate is the genealogist who has the written word of an ancestor! In my case, it is my great grandmother. What a feeling of love and bonding to read her mother’s story, as if it is a voice from the dust. Just recently, I uncovered a copy of my 2nd great grandmother’s story as told by my great-grandmother, Ella “Maud” Leavitt Brown. Maud and her sister Roxie believed that preserving and sharing family history was necessary. With that spirit of record-keeping, they retold the story of their Mother, Ella Gertrude Bird Leavitt to share with their grandchildren.